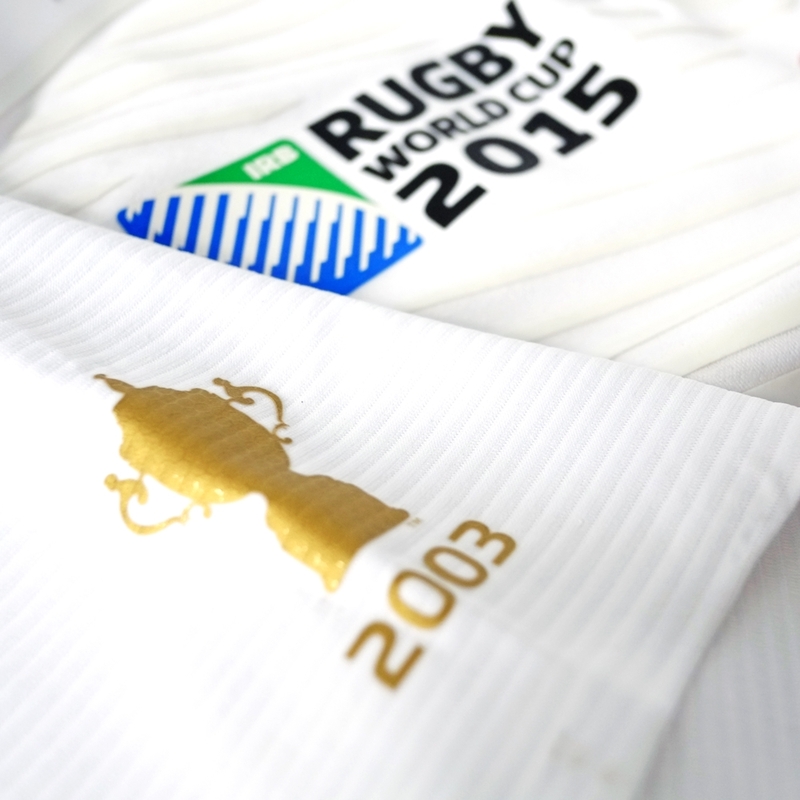 We’ve said on several occasions that with the Rugby World Cup being such a showpiece occasion for the sport and bringing rugby to the attention of so many new and occasional fans, there are two schools of thought with shirt design – you either go classic and timeless, or you go bold, unconventional, and try to get people talking. 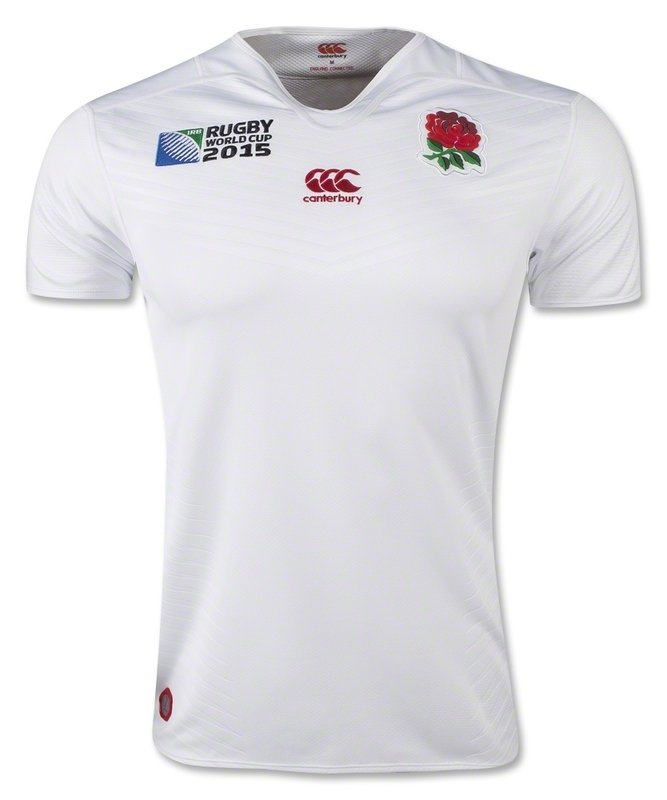 England are the tournament hosts, one of the favourites and also the biggest rugby nation in the world – they don’t need to get people talking, and as such this clean, classic design is perfectly appropriate and is sure to please the crowds. 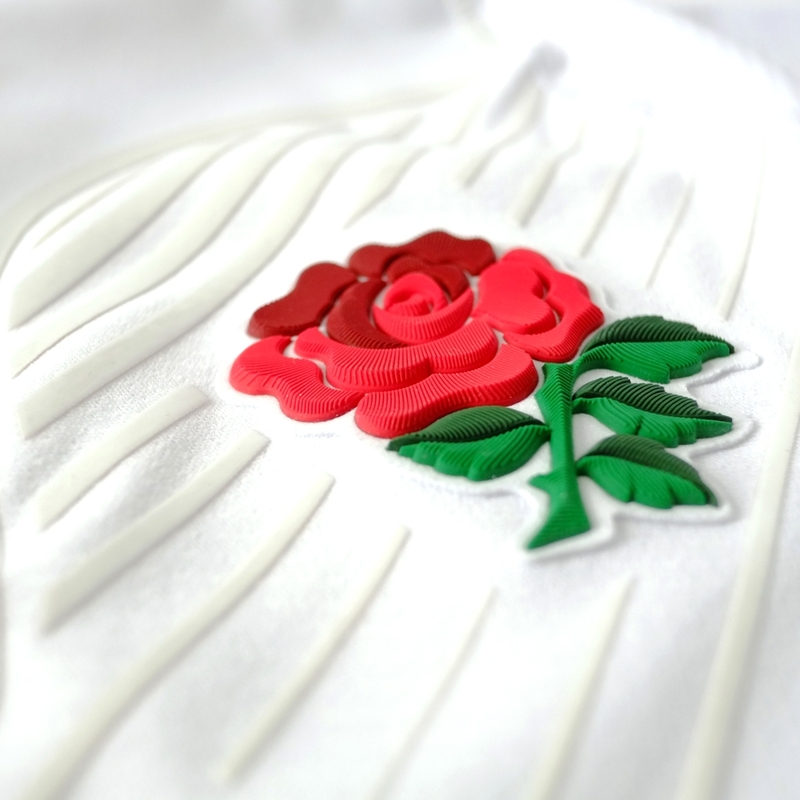 In truth, there’s not much to say about the basic design – last year’s controversial decision to move the Rose to the centre of the shirt has been abandoned due to the tournament rules, and we’re sure that’s pleased many, but with any really great cleanly designed shirt, the devil is in the details. At the launch, we were shown just how much design thought and research has gone into the new shirt, and it’s genuinely staggering. The amount of technology on show is mind-boggling, really – ‘3D body mapping’, ‘adaptive fabrication’ ‘dynamic heat management’… it’s the sort of technical mumbo jumbo that makes the Moon Landings feel like a trip down the shops. But every new kit comes with a labyrinth spiel about how advanced it is, what does it mean in reality to us, the rugby shirt-buying public? Well, we’ve got our hands on the kit and what’s striking is how lightweight and soft it feels compares to previous Canterbury designs – it’s really noticeable, and makes for a very comfortable fit. 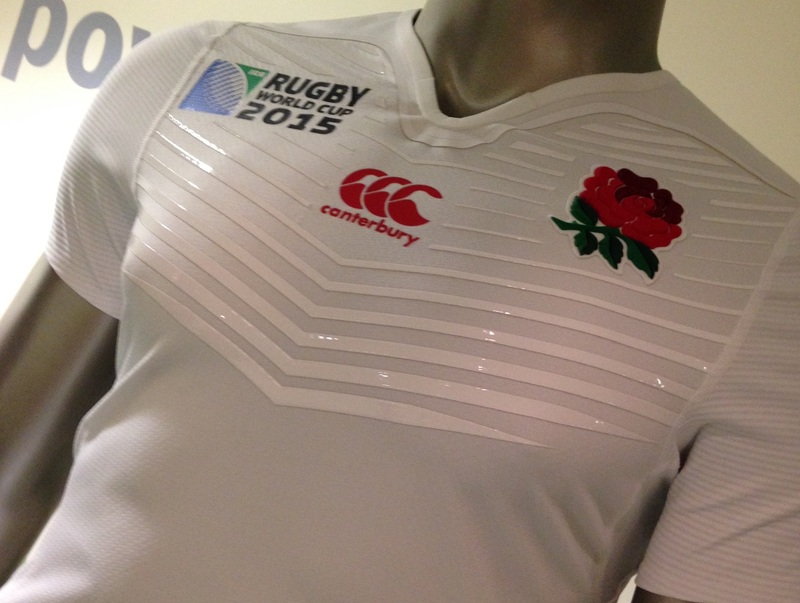 One of the big talking points was the V-shaped ‘ball-deadening’ grip material on the top half of the chest – which ostensibly is pretty similar to the ahem ‘unique’ chevron design the All Blacks RWC shirt has. We think it looks pretty cool actually, and is very striking in the flesh. It adds a bit of dynamism to what could be a pretty plain shirt otherwise, but doesn’t compromise the overall vibe. While we’re talking about the top half of the jersey, it’s worth mentioning the Canterbury trademark Loop collar has been redesigned yet again. The new ‘360-degree Loop Neckline’ is a single bonded piece of elasticated material – so what? Well, previous Loop collars have been, shall we say, restrictive, if you’re larger of head – the new stretchy Loop design should make it easier and more comfortable to get into and out of, but it’s still strong, durable and feels very solid. The biggest talking point about the new shirt is also what we think is the coolest part, and one of the coolest little design features we’ve seen on any World Cup shirt this year. Rather than stitch the badge on, or heat-emboss a rubberised transfer, the Red Rose has instead been 3D injection moulded, giving it a really, really cool textured, tactile effect. It looks cool in photos but we can’t stress enough how cool it looks in the flesh – it really makes the badge pop out from the shirt both literally and figuratively. 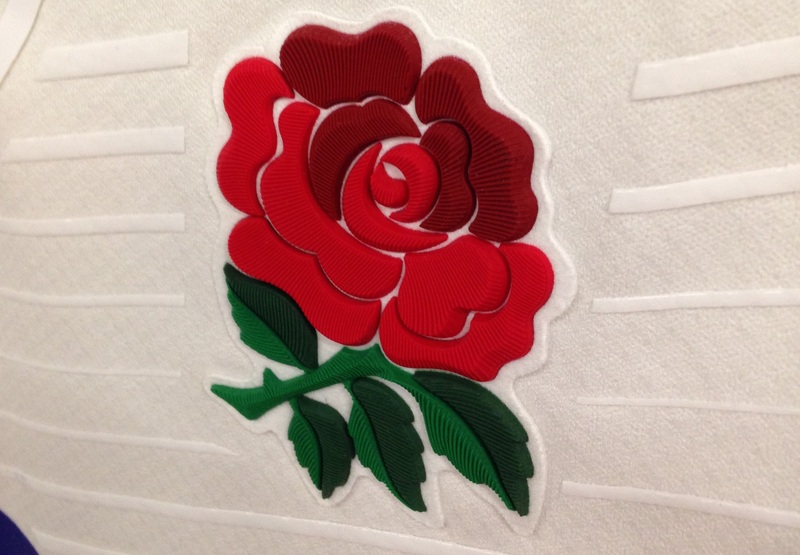 Indeed, it’s not just the fans who are getting excited about the 3D rose – we chatted to Saracens and England front rowers Mako Vunipola and Jamie George at the launch, and the new badge was the first thing they mentioned. 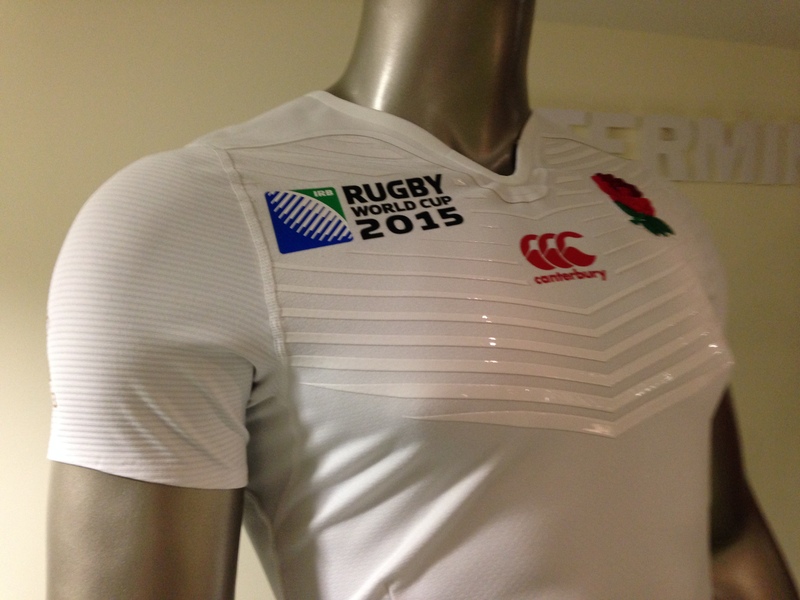 Round the back, irrational flag-haters will be dismayed to see a teeny tiny St George’s Cross on the back of the shoulders, alongside a rather old-school box for the numbers (love that) and you can see how the new Loop neckline is more than just the collar itself. All in all, this is a victory for a simple, clean, classy design fused with the cutting edge of shirt design. 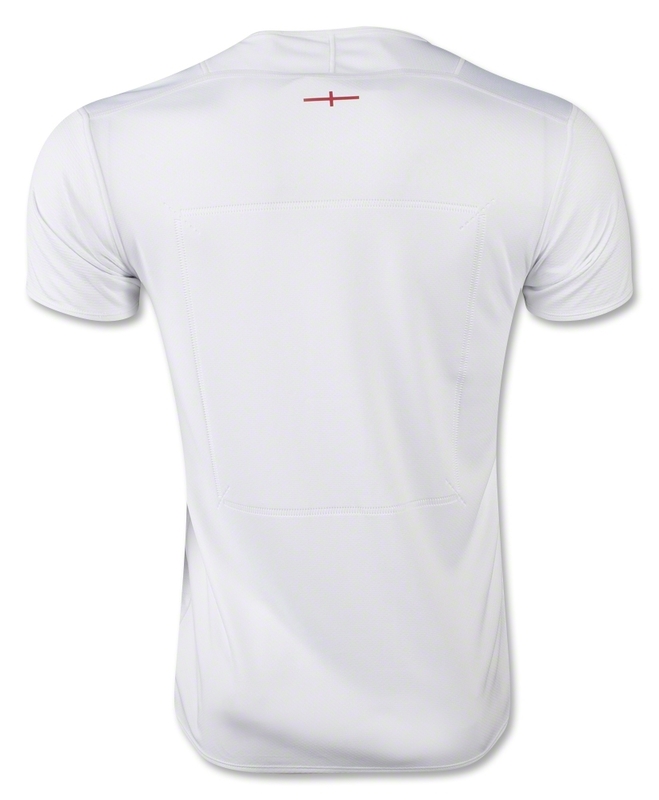 The basic design is one as classic as anything England have worn in recent years, but the inclusion of ultra-modern new features such as the 3D injection moulded badge show that this is far from a retro shirt. Nice. Any ideas if the other logos are moulded or embroidered? As they say, the quality’s in the detail. The shirts are growing on me a little, I’m glad they’re all white. Let’s see if I still like it come payday. We only have the test shirt to go on, Adrian, but we can tell you that the other logos are heat-transfers by the looks of it. Feels very, very sturdy and well done, however. It’s not bad, but I think the V thing is a little weird looking in a Union top and think their design last year with the Victoria Crosses, slight collar and rose in the middle was more interesting and attractive.